Day 1 of the 1st ASPC African Sport Forum kicked-off at the Moses Mabhida Stadium in Durban with over 300 delegates from across the Continent, including 150 sports leaders, administrators, coaches and athletes from KwaZulu-Natal as well as 150 elite athletes who attended the ASPC Workshop (Life After the Podium) which ran in parallel to Day 1 of the Forum. 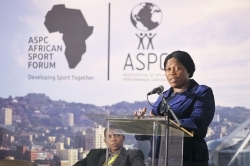 The 1st ASPC African Sport Forum is hosted by Association of Sport Performance Centres (ASPC) in partnership with the KwaZulu-Natal Department of Sport and Recreation. The event is also supported by the South African Sports Confederation and Olympic Committee (SASCOC), the eThekwini Municipality and the Durban Chamber of Commerce and Industry. KZN MEC for Arts, Culture, Sport and Recreation, Mrs Bongi Sithole-Moloi, said there is no doubt that the main thrust of the sport development programmes is to ensure that we achieve transformation in all our sports codes. "In our Province, we have the Elite Athlete Development Programme (EADP), which is hosted here at the Prime Human Performance Institute to assist in creating more podium athletes. This programme, while it is scoring some important successes, is not enough to cater for all the talent from KwaZulu-Natal, especially from rural areas and townships," said the MEC. "It is, therefore, our hope and expectation, that this Forum will be able to bring forward lessons and solutions from the African continent to assist us in reaching, nurturing and managing the abundance of talent that we pride ourselves of as the Province," concluded Sithole-Moloi. The theme for the Forum is African Solutions for African Athletes and topics for Day 1 covered good governance, transformation and the business of sport. The Forum was very interactive and created several opportunities for all stakeholders and delegates to share knowledge and best practice as each topic in the planned programme ended with a related panel discussion. Dr Kevin Subban, ASPC Continental Vice-president for Africa, said that this Forum is the first time that the ASPC has hosted a Continental Forum in Africa and the hope is that the various countries involved can share knowledge and expertise that is relevant to the current African sporting context. This Forum has created a unique opportunity for leaders in Sport to meet, share knowledge and build networks to benefit our athletes, and there has been a lot of good will and networking at the Forum that will benefit sport in Africa as a whole," said Subban. The topics covered in Day 1 included Multi-Culturalism In Sport presented by Dr Ntshengedzedi John Mphaphuli, who holds a PhD in Anthropology, specialising in Culture and Social Transformation, from the University of KwaZulu-Natal; Principles Of Good Governance presented by Prof Rian Cloete, Head of the Department of Procedural Law at the University of Pretoria and Director of the Sports Law Centre; Public-Private Partnerships presented by Fetsi Mbele, Sponsorship Manager: Africa of Ab InBev; IOC Athlete Support Programmes presented by Josep Escoda, Chief International Relations - Innovation and Development at CAR (Centre d'Alt Rendiment); and The ASPC and their role in sport presented by Dale Henwood, Global President of the ASPC. The Durban Chamber hosted the full-day ASPC Workshop (Life After the Podium) which was tailor-made for elite athletes, equipping them with life and business skills which will enable them to plan and manage their lives and finances during and after sport. The theme for the Workshop was Making a game plan for your life. The Workshop started with a panel discussion in which former athletes shared their life stories and experiences. Amongst the panel was Delron Buckley, former South African footballer and owner of the Delron Buckley Soccer School, who stressed that workshops like this are crucial. "These workshops create awareness for athletes and foster knowledge and skills development in order to provide balance for athletes who are busy managing their life in and out of sport," said Buckley. Another panellist was MacBeth Sibaya, retired South African footballer, said that most people do not know how their body is designed to perform, unlike elite athletes. "However, elite athletes do not have the skills to perform in life after competitive sport. This workshop serves to educate and upskill elite athletes to win off the field of competition," concluded Sibaya. The Workshop topics included Financial Planning In 6 Steps presented by Simphiwe Mkhize, Financial Planner at FNB; Marketing Your Best Product "YOU" presented by Brian Naidoo, owner of WordWorks Emerging Leadership Corporation; Legal Contracts presented by Seugnet Lourens, Senior Associate at Strauss Daly; and Life After the Podium presented by Delron Buckley. The Durban Chamber presented the final topic which covered how athletes can register their business with the Companies and Intellectual Property Commission (CIPC) and business support services, policy and advocacy as well as employee health, wellness and safety advice. Durban Chamber President, Musa Makhunga said that empowering athletes with business skills and knowledge can only strengthen their active participation in the economy as they are brands and businesses that directly and indirectly support jobs and revenue streams. "With the knowledge gained from this workshop, these athletes will build their personal brands further, leverage them for present and residual income, and explore alternative business and career options outside of sport," said Makhunga. Day 1 of the Forum closed with an official Mayoral Reception at uShaka Marine World Aquarium to welcome the athletes and international delegates to the 1st ASPC African Sport Forum hosted by eThekwini Mayor Zandile Gumede. Zandile Gumede, Mayor of eThekwini Municipality, said that she was pleased with the turn-out of the delegates. "With such a diverse and knowledgeable audience, I am certain that we will be able to come up with solutions to the challenges currently facing athletes in our continent." Gumede emphasised that the City is committed to promoting sports not only for social cohesion but as a contributor to the economy of the city and ultimately the country," said Gumede.